Click the link below the main image to see more pictures. Hippie clothes. Bohemian clothing. Artsy clothing for expressive women! Presenting classic gypsy hippie chick bohemian shabby chic styles for creative women. Handmade boutique styles at affordable prices. 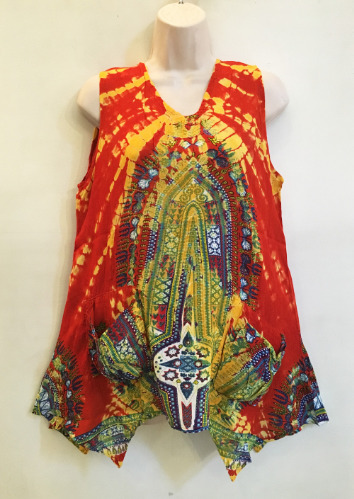 100% Rayon ethnic Tie Dye Dashiki block print gypsy peasant pixie hem top. AUTHENTIC Hand block printed dashiki patterns over-dyed in tie dye. This blouse features a super cute pixie handkerchief hemline with bunch pockets. These garments are individually handcrafted and hand dyed using natural dye. Each garment is distinctive and made specially for you. Garment to garment variation in color is the natural and unique characteristic of this excellent product. Traditional Indian shape and design. Fabric has some stretch and very comfortable. These tops are the real deal: authentic handmade dashiki print and tie dyed fabric. Because of the handmade nature of these blouses, tie dye patterns can vary a bit from item to item. Check the measurements below.